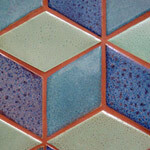 Welcome to the new and improved Aliberti Art Tile website! 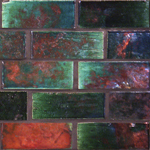 Now you can purchase items online from our tile gallery as well as read about the artist's techniques and view the portfolio. We strive to create inspiring and architectural-conscious work by considering forms and rhythms that exist on site. We utilize traditional hand-forming techniques while embracing contemporary full-service studio design, as well as stocking our original, boutique tile line - all to help our clients realize their dreams. The clay-body is regionally supplied and specially engineered sculpture body with a high-recycled material content. The ceramics retain its shape and strength even in the harshest surroundings. It is made of ecologically benign minerals and is truly a sustainable, maintenance-free material. 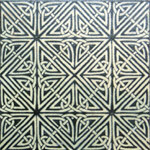 Wave Tile 4" x 8" Chevron Tile 4" x 12" Raku Subway Tile 3" x 8" Rhombus Tile 4" x 8" Celtic Knot Tile 8"